This range of plush toy hamsters has been massively popular. They make ideal pet alternatives - sometimes a child isn’t considered responsible enough to have a real pet just yet or perhaps mum and dad are not keen on the idea of having a real hamster in the house. Or maybe you just want to have an incredibly cute toy that is utterly addictive. Whatever your reason for choosing this range you are sure not to be disappointed. With many of the benefits of owning a pet without the feeding, gruesome cleaning up and smells and no more tears for lost or deceased Hamsters, these loveable interactive toys make perfect substitutes for the real thing. Go Go Hamsters or Zhu Zhu Hamsters are available in many different designs each with their own name and not once will you have to pull up the floorboards to try and locate them! See also Zhu Zhu Babies, Princess and Puppies. Choose between Hamster names such as Mr Squiggles who hides and plays tricks and is a fawny brown, or Num Num who’s shy but affectionate and is Grey, or Nugget who is gingery orange and a bit of a day dreamer, or Pipsqueak a very pale peachy fawn and a real brain box and many, many more options making them highly collectible – each with their own unique character and mannerisms. Every hamster has 2 play modes whether you want them to be in nurturing mode where they stay still and just purr or coo, just like when a hamster is sat on your lap being stroked or perhaps you want the adventurous mode for them to go exploring and responding to their habitat both with their audio and mechanical functions. 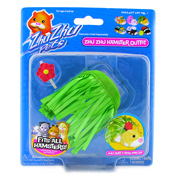 This mode can be used in conjunction with one of the many playsets available such as the exercise ball where you can watch them go round the room just like the real thing or build a hamster world with the Deluxe fun house and grooming salon - after all you do want those hamsters looking their best at all times. Talking of appearance look at the wonderful outfits which are available – dress them up in themes – make them a ballerina or even a sailor. Of course you will need something to carry them around in so try a hamster carrier, which looks just like those bags stars carry around holding their favourite pooches. For sleeping you will need a Hamster Bed and for travel consider the Hamster Car or Wagon, Speedboat or even the Hamcycle, which is a unique take on motorcycle and sidecar!